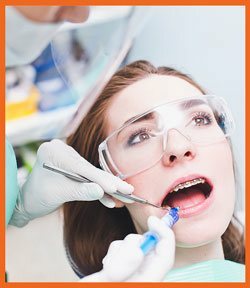 Braces are used for orthodontic treatments in order to treat malocclusions and irregular bites. Sometimes there are jaw and tooth alignment problems when teeth may seem straight but the upper and lower jaws don’t meet properly. Such situations might result from thumbsucking, injury, early tooth loss in the childhood, etc. If you have an abnormal bite, your orthodontist might recommend you get braces or other orthodontic options in order to straighten your teeth and smile. It not only will make your smile look nicer, but also it will also improve your oral health. If abnormalities in bite are left untreated, it might result in tooth loss, tooth decay, gum disease, jaw problems, enamel wear, etc. Moreover, it may affect your speech and chewing. Traditional braces will straighten your teeth by applying pressure on them. It usually includes small brackets attached to the tooth’s surfaces, connected with a wire, which is regularly tightened in order to progressively shift teeth and jaw in the correct place. The brackets may be tooth colored or metal. Alternatively, they may be placed behind your teeth to make your treatment more discreet. Abnormal bites usually become obvious between the ages of 6 and 12, the treatment usually begins between the ages 8 and 14. The earlier the treatment begins the better and faster result you are able to achieve. That doesn’t mean that the adults can’t get orthodontic treatment, but it means that the overall treatment may take longer than usual. All in all, teeth can be orthodontically treated at any age. The length of the treatment is based on each situation individually, but usually, treatment is from one to three years long. After the braces, the treatment will be followed by a period of wearing a retainer, which holds your teeth in the correct position. Nowadays, braces are more and more comfortable, requiring fewer adjustments. Newer materials apply a gentle, constant force in order to move teeth into correct alignment. While you wear braces, it is very important to maintain a healthy and balanced diet and try not to eat sugary or sticky foods, because it leads to plaque build up on the brackets, which may result in stains or tooth decays. Not all of us are born with beautiful smiles, but we can all maintain great oral hygiene routines and with a little help from the professionals, we are able to achieve healthy and beautiful smiles. This is the most traditional option of all the braces. This treatment utilizes metal brackets which are attached to tooth surfaces and connected with a metal wire. Nowadays, brackets are a lot smaller and less noticeable than most adults remember. Depending on the wire used, some of them are heat-activated, which helps them to achieve quicker results with less discomfort. Pros: Cheapest alternative. There is a wide variety of colored bands (which kids really like and it helps them to express themselves). Same size and shape as metal brackets. They are tooth-colored, so they easily blend with the teeth, which makes them less noticeable. Even the wire that connects the brackets is tooth-colored! Pros: Less noticeable, moves teeth faster than Invisalign. Cons: More expensive than traditional braces. Stains quicker if the patient doesn’t take a proper care of maintaining good oral hygiene. Look the same as traditional braces. The only difference is that this type of braces is placed behind the teeth on the lingual surface. Pros: They aren’t visible from the outside, so no one can tell that you have braces. Cons: More difficult to adjust, because it is very uncomfortable at first. It may take longer to adjust with the braces than with traditional braces. Moreover, they are more expensive and not suitable for all cases. What is more, they are very difficult to clean, so you may need to pay extra attention to maintain good oral hygiene. It is a clear plastic aligner which looks like a mouth guard">mouth guard. It usually consists of a series from 18 to 30 custom-made aligners. They are removable and replaced every 2 weeks. Pros: Invisible. People can eat and drink whatever they want. Cons: Can’t be used for difficult and severe cases. They are only used for adults and teens, not for children. It is possible to lose the aligner since they are removable. If you are interested in getting orthodontic treatment, we would be happy to see you at First Class Dental. Feel free to schedule your appointment with our specialist today! (661) 383-2888. 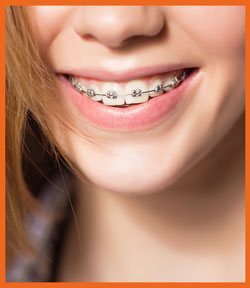 Braces are used for orthodontic treatments in order to treat malocclusions and irregular bites. Sometimes there are jaw and tooth alignment problems when teeth may seem straight but the upper and lower jaws don’t meet properly. Such situations might result from thumbsucking, injury, early tooth loss in the childhood, etc. If you have an abnormal bite, your orthodontist might recommend you get braces or other orthodontic options in order to straighten your teeth and smile. It not only will make your smile look nicer, but also it will also improve your oral health. If abnormalities in bite are left untreated, it might result in tooth loss, tooth decay, gum disease, jaw problems, enamel wear, etc. Moreover, it may affect your speech and chewing. Traditional braces will straighten your teeth by applying pressure on them. It usually includes small brackets attached on the tooth’s surfaces, connected with a wire, which is regularly tightened in order to progressively shift teeth and jaw in the correct place. The brackets may be tooth colored or metal. Alternatively, they may be placed behind your teeth to make your treatment more discreet. This is the most traditional option of all the braces. This treatment utilizes metal brackets which are attached to tooth surfaces and connected with a metal wire. Nowadays, brackets are a lot smaller and less noticeable than most adults remember. Moreover, some of them are heat-activated, which helps them to achieve quicker and less painful results. Same size and shape as metal brackets. They are tooth colored, so they easily blend with the teeth, which makes them less noticeable. Even the wire that connects the brackets is tooth-colored! It is a clear plastic aligner which looks like a mouth guard. It usually consists of a series from 18 to 30 custom-made aligners. They are removable and replaced every 2 weeks. Cons: Can’t be used for difficult and severe cases. They are only used for adults and teens, not for children. It is a possibility to lose the aligner, since they are removable.